Checking doneness is accomplished in basically the same manner regardless of the cooking method you are using. While some methods are more accurate than others, there are certain cuts for which some methods will not be suitable. Shown below are the most common methods for checking doneness. Thermometer: Using a thermometer is the most accurate method for testing doneness. 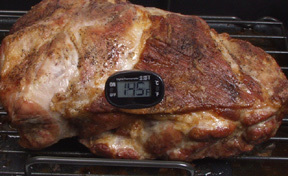 A regular meat thermometer is inserted before placing the meat in the oven or other heat sources and it remains there throughout the cooking time. An instant read thermometer is used to check for the proper temperature once the meat has been cooked. The meat is removed from the heat source and the instant read thermometer is inserted into the thickest part of the meat to provide a temperature reading in approximately 15 seconds. When checking doneness, remove the meat from the heat source as it reaches an internal temperature that is 5 to 10 degrees lower than the desired doneness temperature for that cut. The meat should stand for 10 to 15 minutes before serving or carving. During the standing time it will continue to cook and the temperature should rise to the appropriate internal temperature. Removing the meat when it has reached a temperature that is 5 to 10 degrees lower than the desired temperature and allowing the meat to rest (the 10 to 15 minute standing time) will ensure that the meat will not be overcooked. Smaller cuts such as chops, steaks and cutlets can be left to stand for a shorter period of time, approximately 3 to 5 minutes. A meat thermometer will not work for checking doneness of some pork cuts. Cuts such as bacon, ribs, pork patties, cubes, and strips would not be able to have doneness checked by the use of a thermometer. Other methods of checking doneness would have to be used. Thinner cuts of chops and steaks are also difficult to check with a thermometer, but if thick enough, it can be inserted from the side into the middle of the chop to get an internal reading. Note: When either type of thermometer is inserted into the meat, it must not be touching a bone or it will result in an inaccurate reading. Piercing: Another method for testing doneness is to prick the cut of pork with a fork or the tip of a knife and check to see if the juices that escape run clear. If the juices are clear or have just a very faint pink tint, the meat is done. If the juices are not clear, the meat should be returned to the heat source for further cooking. Meats that are being cooked by the use of a long braising or stewing method must be tested for doneness by piercing the meat with a skewer or long knife. The object should slide in and out without any resistance when the meat is properly done. A meat thermometer cannot be used to test for doneness because when using these long cooking methods, the meat will reach its maximum cooking temperature long before it reaches the tenderness you are trying to achieve. Visual: The visual method of determining doneness works best on smaller cuts of pork such as thin chops, steaks, cutlets, and medallions. Make a small slit with the tip of a knife into the thickest or center part of the cut and then pry the slit open. The meat will be opaque and have a slight pinkish tint if it is properly done to provide a juicy and tender piece. If the meat shows any signs of not being done, it should be returned to the heat source for further cooking. Some smaller cuts of pork can only be checked for doneness by visually looking at them while they are being cooked. Cuts such as sliced bacon and pork strips are browned to desired doneness, but suggested cooking times should be followed to avoid overcooking. Ground pork should be cooked until it no longer shows any pink coloring. 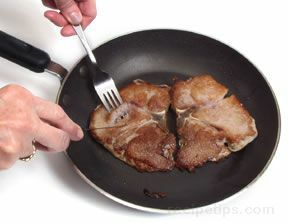 Touch: Cuts such as chops, steaks, ham slices and medallions can be tested for doneness by touch. When pressed with tongs or a fingertip, the cut should feel firm but easily spring back to shape. Some juices may be released, which should be clear or have only a faint tint of pink coloring. Meat that is not done will feel soft and will release darker pink juices. A well-done cut will feel fairly firm when touched and will release little or no juices.